Much of the Guardian’s coverage of Israel and the Palestinian territories suffers from a basic failure to understand cause and effect. Take, for instance, how reporters typically try to contextualize deprivation in Gaza as a ‘result’ of Israeli restrictions on the entry of some (mostly military-related) goods. Rarely, do reporters explain the ‘root cause’ of such Israeli policies: the basic need to protect their citizens from harm by slowing the flow of weapons to the terrorist group Hamas. It’s Hamas’s belligerent policies, based on an ideologically-motivated desire to annihilate Israel, and not the Israeli response to Hamas, that is the driving force behind the crisis in Gaza. Likewise, reports which focus on the injurious impact of Israel’s security fence on Palestinian lives often downplay the reason the fence was constructed in the early 2000s: to prevent suicide bombers from crossing the then porous boundaries between Israel and the West Bank and murdering innocent civilians. As with coverage of Gaza, reports mostly fail to make a connection between decisions made by Palestinians to launch attacks with the resulting security measures and subsequent impact on Palestinian civilians. 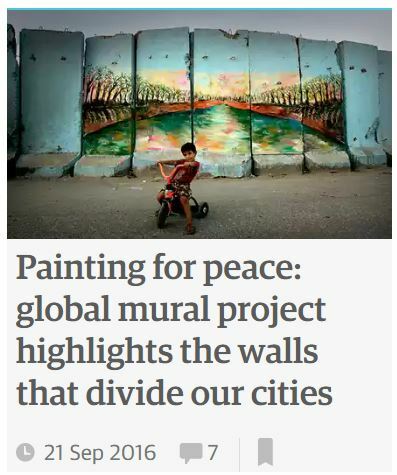 This pattern of omission concerning the basic causation of events is repeated in a Guardian article written by Ellie Violet Bramley (Painting for peace: global mural project highlights the walls that divide our cities, Sept. 21) which actually ignores entirely the motivation for the security fence. First, Bramley’s focus on “walls within cities” all over the world is far more sympathetic to some walls than others. While many of its walls have been built for security around schools and hospitals, or for protection against militant attacks, they’re also to keep sectarian communities apart: a three-mile wall was built by US soldiers in 2007, for instance, which gated off a minority Sunni community. In most cases, separation walls are imposed, usually by some sort of authority, and usually against the wishes of some, if not all, affected inhabitants. The separation wall in Jerusalem, for instance, built by Israel from 2002 onwards to cut East Jerusalem off from the rest of the West Bank, has been built against the wishes of the overwhelming majority of Palestinians. The article also includes a photo of the fence in Baghdad with a caption describing it as a “security wall”, while the caption beneath a photo of Israel’s fence characterizes it as “the West Bank wall”. Of course, those unfamiliar with Jerusalem would never know from these passages that there are in fact roughly 300,000 Arabic-speaking Palestinians (mostly Israeli residents) who live in the city and are free to travel anywhere, both in the city and the country. Israelis hear quite a bit of Arabic in the capital. Further, the city’s racial, ethnic and religious diversity ensures that most residents do in fact often see faces “that [don’t] look like theirs”. Additionally, as our colleague Tamar Sternthal noted recently in response to an article in the International New York Times, the city isn’t “strictly segregated” into the Palestinian “east” and the Jewish “west”. “Increasing numbers of Jerusalem Arabs are opting to move to largely Jewish neighborhoods over the Green Line including French Hill, Neve Yaakov, and Pisgat Ze’ev”, she explained. By failing to explain why the security fence dividing Israel and the West Bank was erected in the first place, and erroneously suggesting that Jerusalem is a segregated city, the Guardian once again grossly misleads readers by favouring narrative over the nuanced reality of everyday life in the Jewish state. An Israeli Arab asks the Guardian: Why didn’t you explain the reason Israel built its “wall”? These days I assume that hating Israel is in The Guardian’s journalist and editor contract – overt antisemitism preferred. Ah, Pullan – another ignorant, pompous, barely literate thicko who images herself an ‘academic’. “erroneously suggesting that Jerusalem is a segregated city” – LOL. Define “erroneously”. “the Jewish state” – sheesh, not that utterly moronic phrase again. It is not ‘the Jewish state’. It is the state of the Jews. Actually, John, it’s a state for Jews, Christians, Muslims, Ba’ath, atheists … it is a Jewish state, but others are welcome and their rights respected. Not like many other states in the Middle East and elsewhere which proudly proclaim their bigotry in their names. I didn’t say who it’s FOR. I said who it’s OF. The state is not Jewish. It is the Jewish State, sorry if you don’t like what we call it. Arabs refer to their states as Arab countries, Mexicans call their state a Mexican country, the Irish call their country Ireland ( The country of the Eire). Ethnic Jews make up 80 % of Israel and it is the Jewish State. It doesn’t mean other don’t live in it; they do and are full citizens. John, the State is jewish !!!!!!! It follows the jewish rules ! Judith, kindly take your supercilious bombast and shove it. Who is ‘we’? You don’t know who I am. The Jewish State of Israel ! It is a jewish country where everybody is welcome !